You have just upgraded to your base to town hall 10 are you are getting ‘rekt’ every single day and multiple time. You’ve finally decided that nothing is working for you right now and you need to reframe your th10 base. So, there are a few pretty standard bases that you will always see when you are trying to find a match on coc th10 base multiplayer matchmaking and there is a reason why they are common. 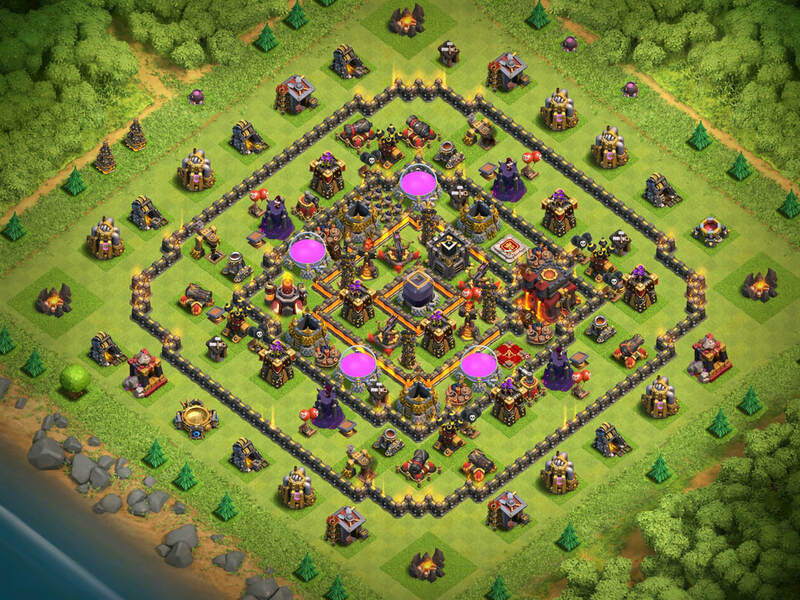 Let’s get into the most common th10 ring base. 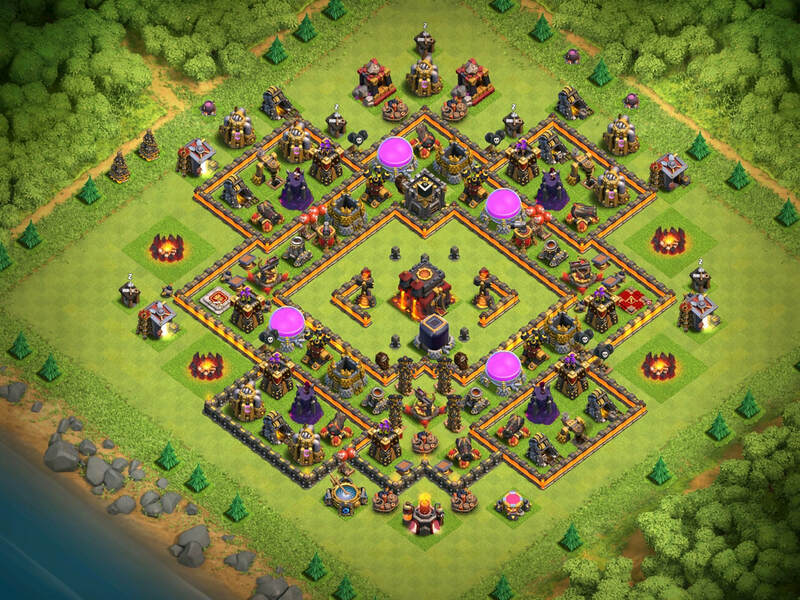 ​This is a very common COC th10 base with Archer Towers at the corners of the base, the common attack start spots of a raider. The center being separated by two wall lines and the double frame keeping structures just out of range of the Archer Queen, not letting her take down any defense in the core. The walls dividing the core, let one Inferno stand even if the other is taken out by Bowlers. The Hidden Tesla's are placed to push Valkyries around the corners instead of in the core. ​This might be the best th10 base for trophy pushing and not farming, let’s discuss the base and then I’ll tell you why. 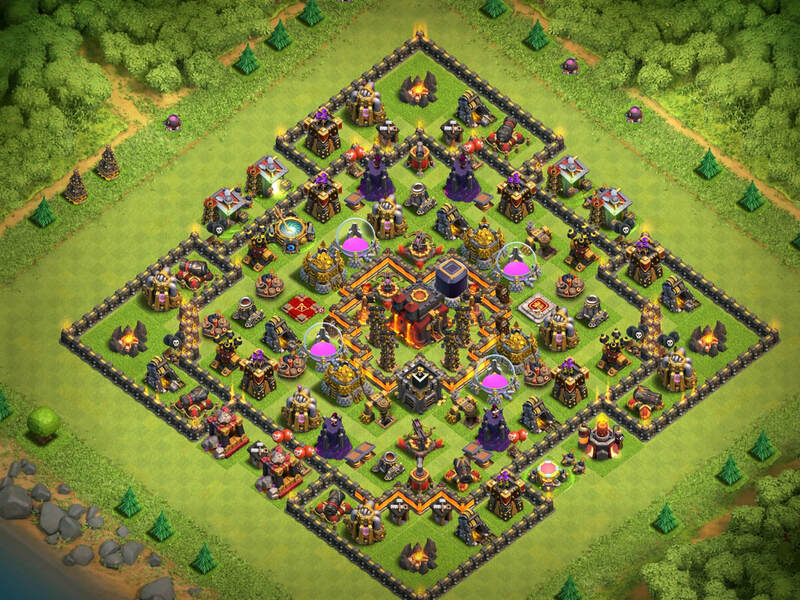 This is a good th10 ring base and most of the raiders won’t attempt the base because it is nearly impossible to get the townhall without destroying all the defenses. Even if the attacker takes out the core walls at the top or sides, the troops won’t push in, according to AIs principle of nearest structure. So, your town hall 10 will always stand, but an attack will give up 3 of each storage type and a bottom attack will also put your dark elixir at stake. 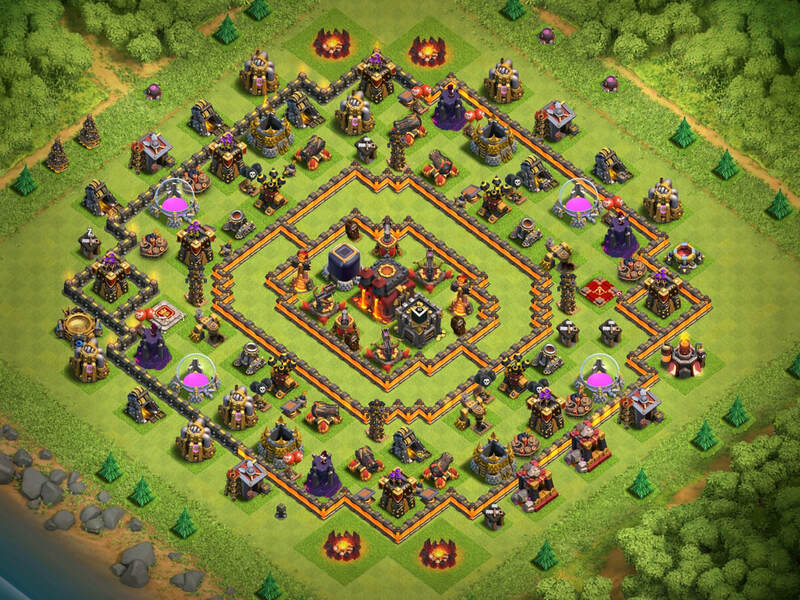 Amongst all the coc th10 bases for farming, this specific th10 base is a delight. The reason being it gives up your town hall and an easy 30-60% damage possibility to the raider owing to the structures outside the walls. So, the raider in most cases gets your town hall, does about 30% damage and then the Inferno Towers melt them down. This leaves you with nearly all your resources and an amazing 12-14h shield plus the 30 min guard. This might be the best th10 base for trophy pushing because it is so common and that I believe that is the problem with it, everyone knows the weakness. The base design is pretty simple, everything except the strong defenses is between the 2 layers of the walls. So, the attacking troops take out everything, except the core, and then are too weak to take the core out. So it could be an easy 90% 1-star. The easiest way to get in these th10 ring bases is to take down the wall layer with Earthquake spells and spam Giants and Rage Spells.